Skip the box and whip up a batch of delicious granola bars at home! 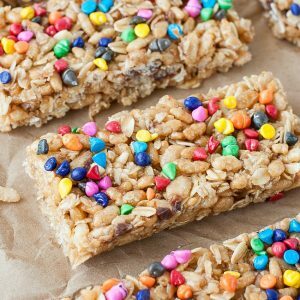 These chewy rainbow chip granola bars are so quick and easy, they're as much fun to make as they are to eat! For easy clean-up, line a 9x9 square baking dish with aluminum foil or parchment paper. For a boost of sweet, nutty flavor, brown the butter by taking an extra few minutes to let the butter bubble into golden perfection. To brown, add an extra few minutes to the cook time of the recipe and whisk the butter occasionally until the butter starts to bubble, then whisk constantly until brown flecks form and butter begins to smell amazing. The smell of brown butter reminds me of freshly baked cookies or warm caramel, I LOVE it! After melting [and/or browning!] the butter, add your maple syrup, honey, brown sugar, vanilla, and sea salt and stir to mix. Turn heat to low, simmer until bubbly, then whisk and remove from heat. Next add the flax, oats, and cereal and stir until the dry ingredients are fully coated. Fold in your chocolate chips and pour into your foil-lined baking dish. Using a spatula, press the mixture until well-compacted, then top with rainbow chip sprinkles. Gently press sprinkles into the granola square and cover pan with a sheet of foil. Chill in fridge for 1-2 hours, this will help the bars cool and set. Remove from pan using foil/parchment and transfer to a cutting board. Cut into rectangular bars or squares and enjoy! For perfect texture, skip whole oats and use quick-cooking oats for this recipe. These oats have been chopped and will help hold the bars together so they're not a crumble-fest! Feel free to make your own with a food processor if preferred! I've done both and la la love these chewy granola bars! To store for later, place bars in an airtight container with foil or parchment paper between each bar to prevent sticking. Bars will keep for 4-5 days and may be frozen for later as well!